After that, your APR will be 14.74% to 27.74%, based on your creditworthiness. This APR will vary with the market based on the U.S. Prime Rate. After that, your APR will be 14.74% to 27.74%, based on your creditworthiness. This APR will vary with the market based on the U.S. Prime Rate. A balance transfer request must be made within 120 days from account opening to qualify for the introductory APR. 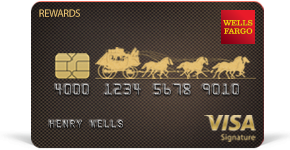 Read the Wells Fargo Visa Signature Card Agreement. Visit wellsfargo.com/signature to learn more about travel benefits and features. Enjoy these purchase protections when you pay with your Wells Fargo Visa Signature card. Purchase Security. Eligible items are replaced, repaired, or reimbursed for the first 90 days after purchase in the event of theft, damage due to fire, vandalism, accidentally discharged water, or certain weather conditions. Price Protection. If you see eligible items advertised for less within 60 days of purchase, the difference will be refunded. Warranty Manager Service with Extended Warranty Protection. Extend the warranty time period on eligible purchases. Cell Phone Protection. Help protect your cell phone from damage or theft when you pay your monthly cell phone bill with your eligible Wells Fargo consumer credit card. Visit wellsfargo.com/signature to learn more about purchase protections. You agree that we may consider you for a Visa Platinum card if you do not qualify for the Visa Signature card. If you opened a Wells Fargo Credit Card within the last 15 months, you may not be eligible for introductory annual percentage rates, fees, and/or bonus rewards offers. See important exclusions below (on page 2 if printed). The "Margin" for purchases and balance transfers will be 9.24 to 22.24 percentage points, based on your creditworthiness. This application is for a credit card with Wells Fargo Bank, N.A. You certify that all information provided is true, correct, and complete and that you have the legal capacity to enter into this contract. The Bank is authorized to verify or check any of the information given, to obtain credit reports on you and to make Overdraft Protection advances if you requested that feature. You authorize the Bank to obtain information from others to investigate your credit, employment and income history and state records including state employment security agency records and to report information regarding your account to consumer reporting agencies. You agree that the Bank will determine the amount of credit extended, as well as which product you qualify for, based on the Bank's review criteria. If you do not qualify for the product or pricing requested or for the lowest pricing offered, you authorize the Bank to grant you the product and pricing for which you do qualify. You agree to be bound by the terms and conditions of the Agreement, which will be sent to you, and understand that the terms of your account may be changed at any time, subject to applicable law. You hereby stipulate to the terms of the arbitration program described in the Agreement. You understand and agree that you will be liable for payment of all amounts owing on the account. The minimum credit limit, provided you meet the terms and conditions of this offer, is $5,000.00. Participating merchants of the Earn More Mall® feature control the variability of the offers shown. Bonus rewards points are earned on net purchases (purchases minus returns/credits) only. Review full Earn More Mall feature Terms and Conditions for all earning details. A maximum benefit amount and certain restrictions and limitations apply. Please review the Visa Signature Guide to Benefits (PDF) for details. Visa Signature® cardholders are responsible for the payment of any and all charges associated with any goods, services, reservations, or bookings purchased or arranged by the Visa Signature® Concierge on cardholders' behalf. Any such purchases or arrangements are solely between the cardholder and the respective merchant, and Visa is not a party to the transaction. All goods and services subject to availability. See full terms of service at visasignatureconcierge.com. Coverage in excess of any other coverage and receipt and other documentation is needed. Must be used within 90 days from the date of purchase, and must be purchased entirely with an eligible Wells Fargo Visa Signature Credit Card or rewards programs associated with your covered Account. Benefit may be used in event of theft; damage due to fire, vandalism, or accidentally discharged water; or certain weather conditions. Benefit is paid at Benefit Administrator's discretion. A maximum benefit amount and certain restrictions and limitations apply. Please review the Visa Signature Guide to Benefits for details. Covers the difference in price between a qualifying purchase and a printed advertisement for the exact item for less at any retail store within 60 days of the original purchase date if claim is made within 10 days of the printed advertisement. Entire purchase must be completed with an eligible Wells Fargo Visa Signature Credit Card account or rewards programs associated with your covered Account. Production of itemized receipt required. A maximum benefit amount and certain restrictions and limitations apply. Please review the Visa Signature Guide to Benefits for details.